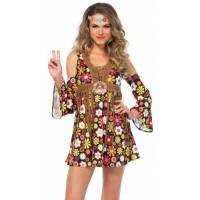 This fun retro style romper is perfect for your favorite music festival or as a groovy Halloween costume with deep fringe. 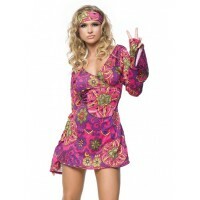 Spread peace and love in Leg Avenue’s Boho Babe hippie costume. Featuring flower power accents on a denim look romper and faux suede sleeves with extended fringe, this fashion inspired look will have you music festival ready in seconds. Perfect for themes parties and Halloween. Includes peace sign necklace, but you’ll have to buy the groovy glasses separately. Item Number: LA-c86703 | Approximate Size (Inches): 10.00 wide x 3.00 deep x 14.00 high | Approximate Shipping Weight: 2.00 lbs.